Through creative innovation & quality craftsmanship, we strive to produce outstanding glass guitar slides and picks that compliment your tone and style. 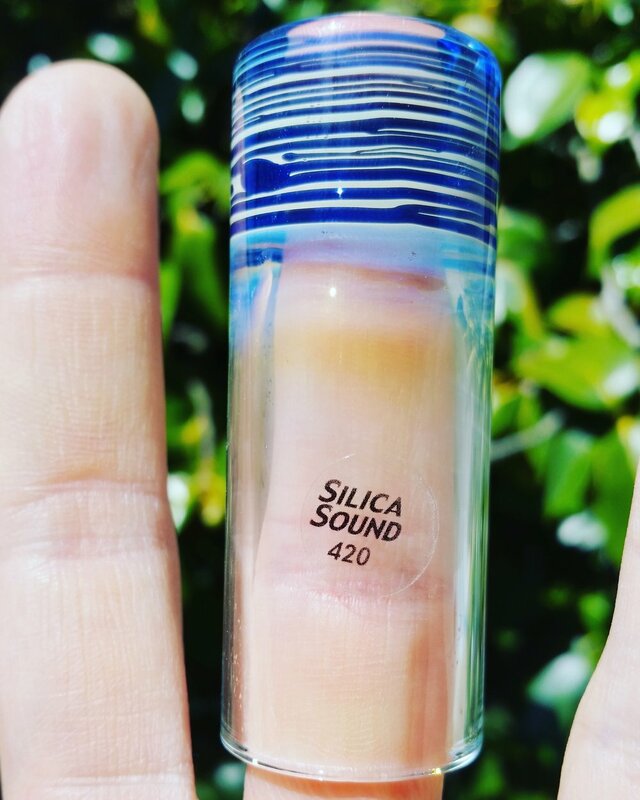 Silica Sound is the original glass guitar slide made with a tapered interior, since 2003. Our 'Original' series guitar slides are individually hand made from durable borosilicate glass. They are each flame-worked with a glassblowing torch, and molten colored glass is added to the end of the slide and melted in. This process forms our unique tapered interior that provides a snug fitting grip, and also adds some eye-catching appeal. It also adds extra mass to the slide, making them superior in tone to any other borosilicate slide. Each slide is fully annealed to ensure maximum structural strength & integrity. The tapered interior in our slides can fit your finger in two different ways. The most common is to have the taper at the tip of the finger. This gives a great grip, keeping the slide snug and stable on the finger. It also gives a great feel to the weight and inertia of the slide. Please note: Because each slide is handmade, every taper does vary slightly in size. We can also customize the taper inner diameter precisely to your specifications. They can also be fitted so the tapered end grips the base of the slide finger. This brings the center of mass towards the base of the finger, giving a similar (yet heavier) feel to a medicine bottle style slide. A larger slide such as the #425, #426, & #428 is necessary for this. If you plan to use our slides this way and want to order one, please just send us a note letting us know. We will make sure you receive a slide with a larger inner diameter at the taper.